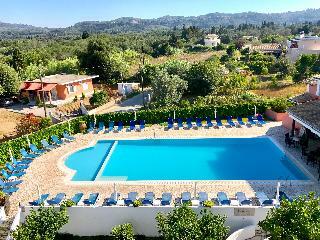 Offerte hotel CORFU. Scopri i nostri hotel e appartamenti più convenienti per il tuo viaggio. L'$hotel. getTypeHotel() Ã¨ stato costruito nel 1993. L'$hotel. getTypeHotel() Ã¨ stato rinnovato nel 2007. La struttura ha un totale di 33 camere. La struttura Ã¨ costituita da 16 camere doppie, 1 suite, 17 appartamenti e 17 miniappartamenti. Le are..
L'Albergo Ã¨ stato costruito nel 1976. L'Albergo Ã¨ stato completamente ristrutturato nel 2014. La struttura ha un totale di 40 camere. La struttura Ã¨ costituita da 39 camere doppie. Questo grazioso hotel Ã¨ perfetto sia per un breve week-end che pe..
FacilitiesA baggage storage service, a safe, a restaurant, a café and a bar are available to guests of the accommodation. Wireless internet access is available to travellers in the public areas. There is also a garden. Those arriving in their own veh..
FacilitiesA lobby and a reception are available to travellers. Services and facilities at the hotel include a safe, a restaurant, a dining area and a bar. Wireless internet access in public areas allows guests to stay connected. Children can have a g..
La struttura ha un totale di 14 camere. ..
FacilitiesServices and facilities at the hotel include a baggage storage service, a restaurant and a bar. Wireless internet access in public areas allows guests to stay connected. There is also a garden. Those arriving in their own vehicles can leave..
Questo complesso residenziale Ã¨ situato a Agios Gordios, una zona verde circondata da alberi e montagne rocciose. Si trova a soli 300 metri dalla spiaggia e proprio nel centro della cittÃ . La spiaggia Ã¨ lunga quasi un chilometro ed Ã¨ una delle mi..
FacilitiesTravellers can feel at home in one of the 12 rooms. Services and facilities at the hotel include a restaurant and a bar. Wireless internet access is available to guests in the public areas. There is also a garden. Those arriving in their ow..
FacilitiesThe hotel offers travellers a range of facilities for a relaxing and revitalising stay. Services and facilities at the hotel include a café and a bar.RoomsEach of the rooms is appointed with air conditioning and a bathroom. 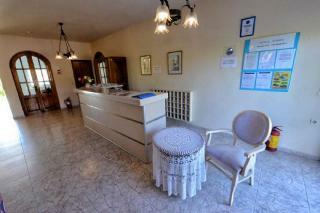 All rooms featur..
FacilitiesThe hotel features a library for a comfortable and relaxing stay. Wireless internet access is available to travellers in the public areas. There is also a garden. Those arriving in their own vehicles can leave them in the car park of the es..
FacilitiesServices and facilities at the hotel include room service and a laundry service. Wireless internet access is available to guests. Travellers can buy daily essentials at the supermarket. There is also a garden.RoomsRooms feature air conditio..
General InformationHotel facilities: gardenRoom facilities: cutlery and crockery, electric rings, fridge, kitchenette, showerLocation InformationDistance from the beach 350m, distance from the airport 16 klm, distance from bus station 350m, distance ..
For stays as from 01/01/2018 or including this date, an Overnight Tax will be payable directly to the hotel upon arrival.Tax will be charged per room per night in Euro currency as below: Properties Licenced as Hotels: 1 or 2 stars 0.50, 3 stars 1.5..
FacilitiesAmenities include a baggage storage service and a safe. Wireless internet access is available to guests in the public areas. Among the culinary options available at the hotel are a restaurant, a café and a bar. Various shops are available, ..
“Elli-Marina Studios & Apartments” is situated in the picturesque village of Benitses in Corfu, Greece. Benitses has earned a reputation as one of Corfu’s finest resorts not the least because it affords its visitors the whole range of holiday experie..
FacilitiesGuests of the apartment complex will be delighted with the range of services and facilities available. Wireless internet access in public areas allows travellers to stay connected. Those arriving in their own vehicles can leave them in the ..
FacilitiesGuest accommodation comprises 60 rooms. A lobby and a reception are available to guests. Amenities include a safe. Wireless internet access is available to travellers in the public areas. Various gastronomic options are available, including..
FacilitiesThe hotel offers a baggage storage service and a bar. Wireless internet access is available to guests in the public areas. There is also a garden. Those arriving in their own vehicles can leave them in the car park of the accommodation.Room..
FacilitiesThe hotel offers a range of services and facilities for holidaymakers and business guests alike.RoomsThe accommodation features rooms with air conditioning and a kitchen. A balcony is included as standard in most rooms, offering additional ..